Risky Business Monday 8th April 2019 Ruth Fuga, Ken Powell and Dave Walmisley came together over 20 years ago after they had all had successful individual music careers. Combining their skills to include, Dave's wonderful lyrics and songs, Ken and Daves skills on the various instruments they play, Ruth's stunningly clear lead vocals and harmonies to die for they provided us the folk and acoustic scene with an eclectic mix of songs that had and overwhelming ability to leave you breathless and cause the hairs on the back of your neck to stand on end. They left us with a memory combined in 4 CD's. Some of which are available to buy at their concerts or by post. They went their separate ways approx 10 years ago to involve themselves in other personal projects. Ken has spent the past 8 years building a reputation as a Luthier and you will see many a guitar, Gasouki or Mandola played around the folk and acoustic scene that's been crafted by his hands. see www.powellguitars.com. Dave has carved a new career in music with the band 'Other Roads' and tours through the year both in the UK and abroad. He now lives in Lytham-St-Anne's, alongside his partner Liz, another musician from the duo Scolds Bridle. Ruth, continues to sing alongside Ken (they married too). Her vocals have not wavered and are still as powerful and clear as ever. Both she and Ken have settled in Wales over recent years and have become heavily involved in the village and its community. This includes the organisation of a new annual folk festival during September. The Llanwddyn Folk and Acoustic festival. Tickets can be purchased on club nights or select WeGotTickets charge a 10% booking fee but you will get instant delivery of your e-mail ticket. Read more about WeGotTickets here. Risky Business Monday 8th April 2019 Ruth Fuga, Ken Powell and Dave Walmisley came together over 20 years ago after they had all had successful individual music careers. Combining their skills to include, Dave's wonderful lyrics and songs, Ken and Daves skills on the various instruments they play, Ruth's stunningly clear lead vocals and harmonies to die for they provided us the folk and acoustic scene with an eclectic mix of songs that had and overwhelming ability to leave you breathless and cause the hairs on the back of your neck to stand on end. They left us with a memory combined in 4 CD's. Some of which are available to buy at their concerts or by post. They went their separate ways approx 10 years ago to involve themselves in other personal projects. Ken has spent the past 8 years building a reputation as a Luthier and you will see many a guitar, Gasouki or Mandola played around the folk and acoustic scene that's been crafted by his hands. See www.powellguitars.com. Dave has carved a new career in music with the band 'Other Roads' and tours through the year both in the UK and abroad. He now lives in Lytham-St-Anne's, alongside his partner Liz, another musician from the duo Scolds Bridle. Ruth, continues to sing alongside Ken (they married too). Her vocals have not wavered and are still as powerful and clear as ever. Both she and Ken have settled in Wales over recent years and have become heavily involved in the village and its community. This includes the organisation of a new annual folk festival during September. 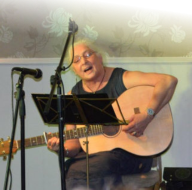 The Llanwddyn Folk and Acoustic festival. Tickets can be purchased on club nights or WeGotTickets. WeGotTickets charge a 10% booking fee but you will get instant delivery of your e-mail ticket. Read more about WeGotTickets here.